Thanks yet again to ANN for breaking the news on K-ON! That's right, 2010 will have yet more Moe with this second season slated for a January 20th DVD/Blu Ray release (in Japan). 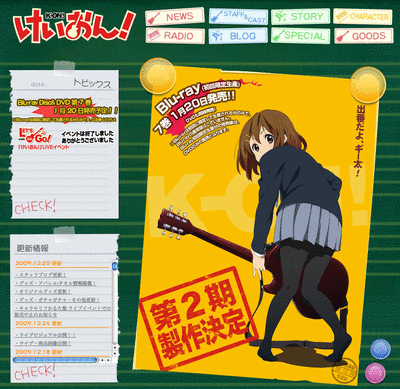 Still wondering when we can watch K-ON! (legally) here in the state. Fans are waiting and to the licensees...that's money down the drain. I'm all for legal downloads to continue to help the industry but if you don't give the worldwide (particularly US) fans what they want...expect the pirating to continue. Can't say I didn't warn them.